George, it seems, had hung out with some of the Hells Angels — who were counterculture darlings at the time — while he was in L.A. working on the Jackie Lomax album. At one point he casually mentioned that if they were ever in London they should look him up, probably thinking that a whole country and an ocean were enough of a buffer zone to keep the motorcycle gang away. But around this time George received word that a contingent of Angels — some of these few not legally constrained from international travel — intended to make the trip. And it would have been uncool, though advisable, to rescind the invitation. So, having wisely taken the precaution of giving the Angels his business address rather than his personal one, George tried to prepare the Apple staff as best he could. In the end, only two Angels arrived, accompanied by an ad hoc entourage. It’s worth noting that George, nobody’s fool, kept his distance throughout their visit; when they disrupted Apple’s Christmas party later in the month, it was John who was threatened with a punch in the face if he didn’t sit down and shut up. But that’s a whole other story, one that we’ll get to when the time is right. 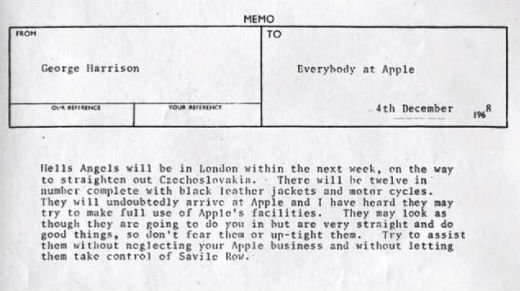 “Try to assist them without neglecting your Apple business and without letting them take control of Savile Row.” One of the funniest things I’ve read all year. ” … so don’t fear them or up-tight them.” Sage advice. Never a good idea to up-tight an Angel.